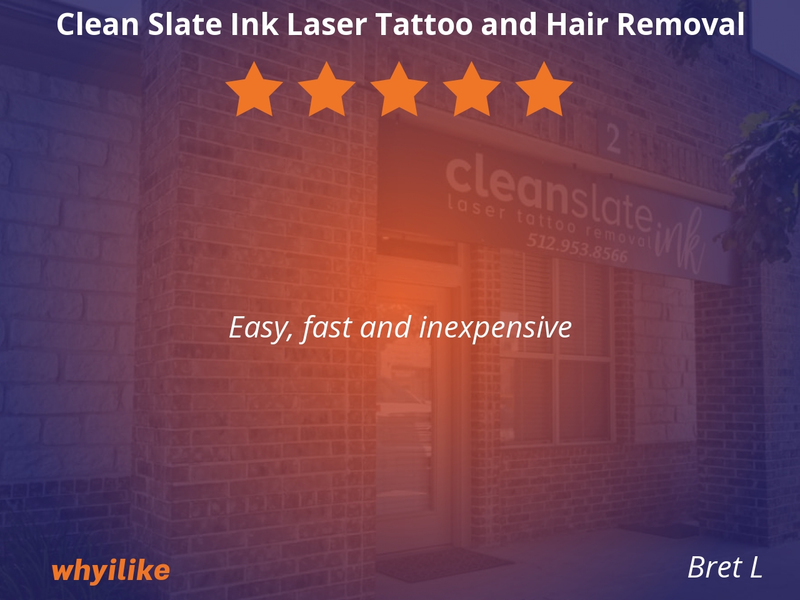 Clean Slate Ink, Austin's newest laser tattoo removal clinic specializes in completely removing unwanted ink, selectively removing a specific part of tattoos, and lightening tattoos down in preparation for a cover-up tattoo. 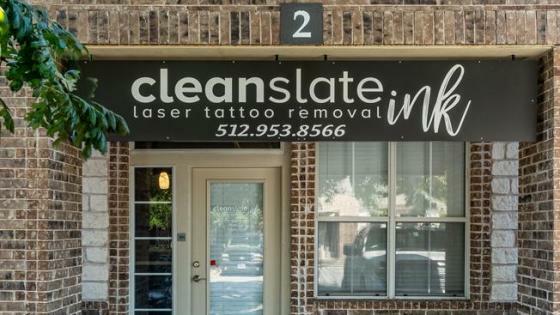 I’ve been wanting to get my tattoo removal for the longest time. I’m not sure why I waited, but I’m glad I did. I saw a video of my friend going there and as a reliable person in the tattoo industry, I took their advice. Chris took great care of me, the procedure was quick and painless, and he guided me through the procedure and aftercare. I definitely recommend him. He’s a wonderful person and made my confidence higher. 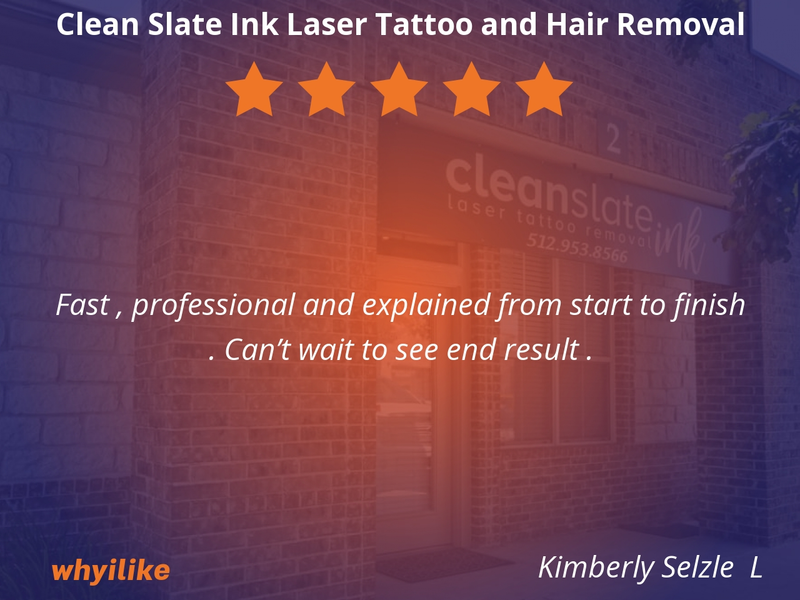 Fast , professional and explained from start to finish . Can’t wait to see end result . Faster and easier than I thought! 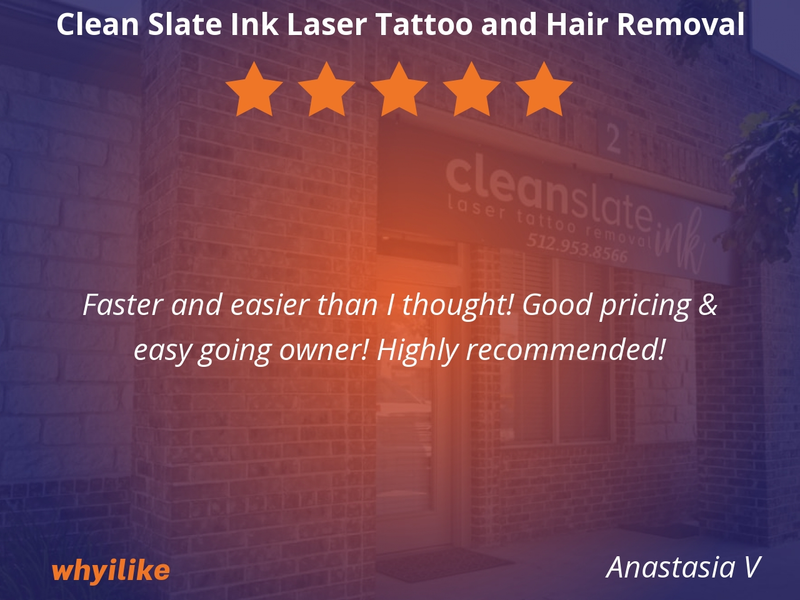 Good pricing & easy going owner! Highly recommended! 1. 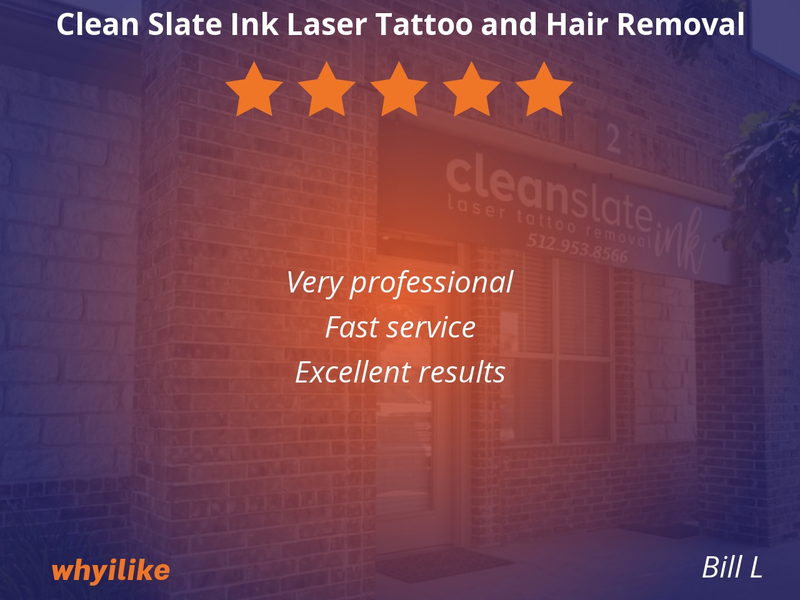 The location is super clean, it’s inviting, and very professional. 2. The service is fantastic. 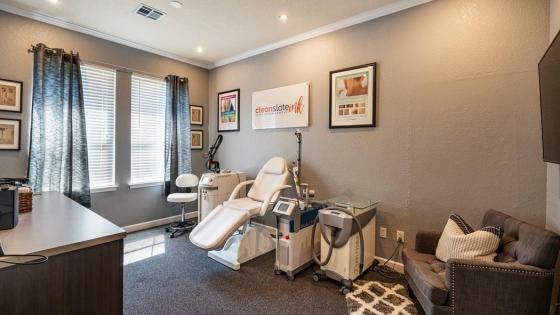 There is a clear methodical approach to removal and you definitely feel like you know everything you need to during your consult. 3. Communication is so easy. Very comfortable setting . 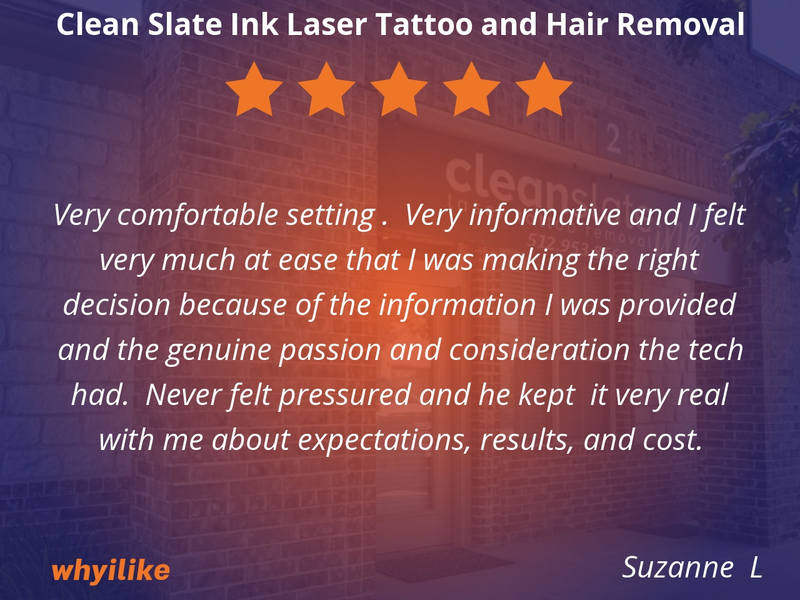 Very informative and I felt very much at ease that I was making the right decision because of the information I was provided and the genuine passion and consideration the tech had. Never felt pressured and he kept it very real with me about expectations, results, and cost. Process was quick and pain was minimal. The office is clean and tidy. A very friendly visit. 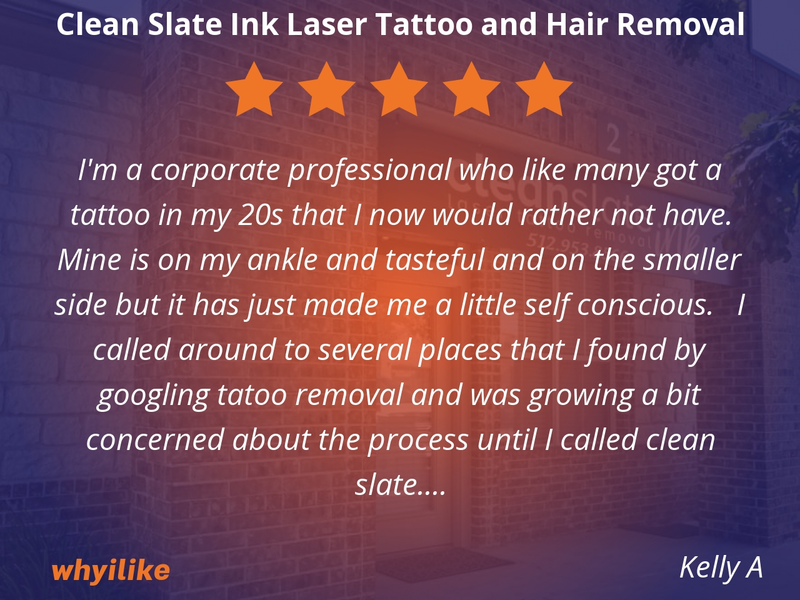 I'm a corporate professional who like many got a tattoo in my 20s that I now would rather not have. Mine is on my ankle and tasteful and on the smaller side but it has just made me a little self conscious. 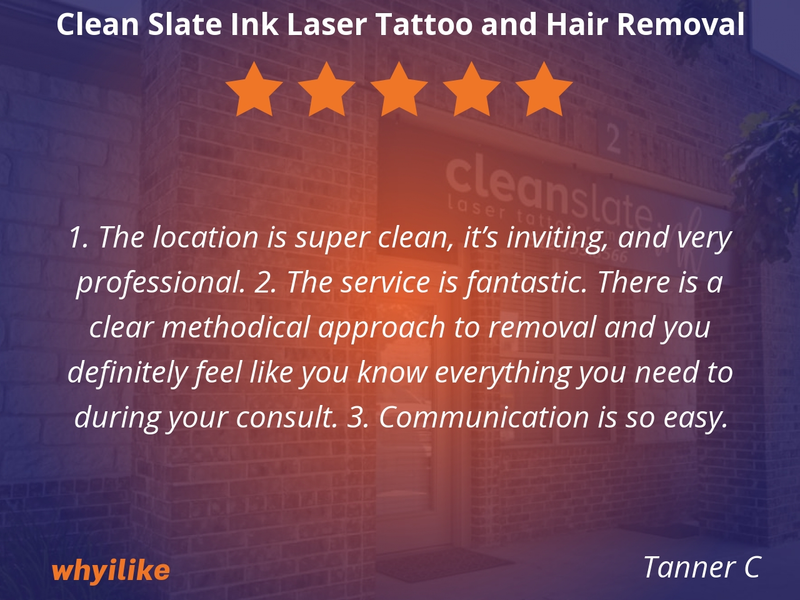 I called around to several places that I found by googling tatoo removal and was growing a bit concerned about the process until I called clean slate. Prompt reply to my initial inquiry, quote within a few moments based on my actual tattoo over text and very thorough explanation of the equipment and procedure as well as the timeline. 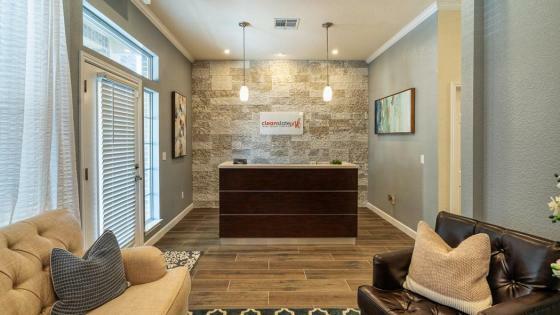 I was able to schedule my first treatment quickly and received top notch care and after care. 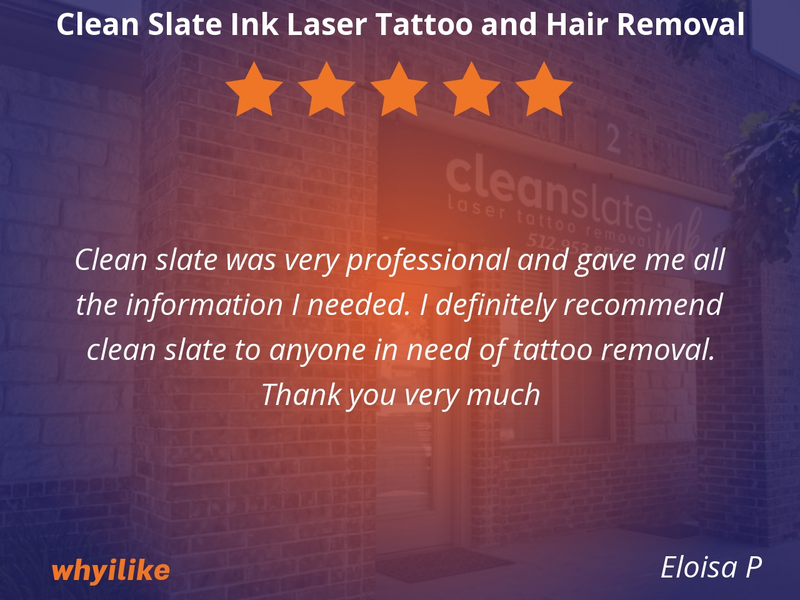 I highly recommend clean slate! 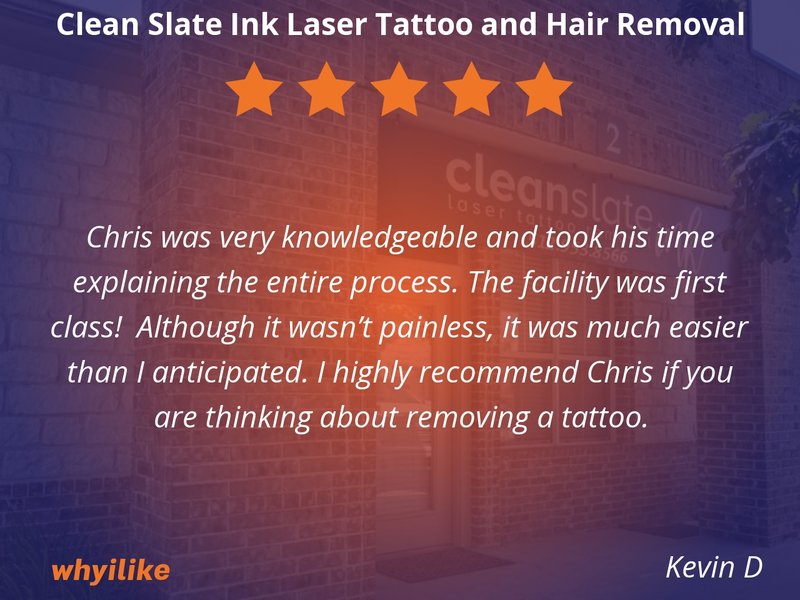 Chris was very knowledgeable and took his time explaining the entire process. The facility was first class! Although it wasn’t painless, it was much easier than I anticipated. 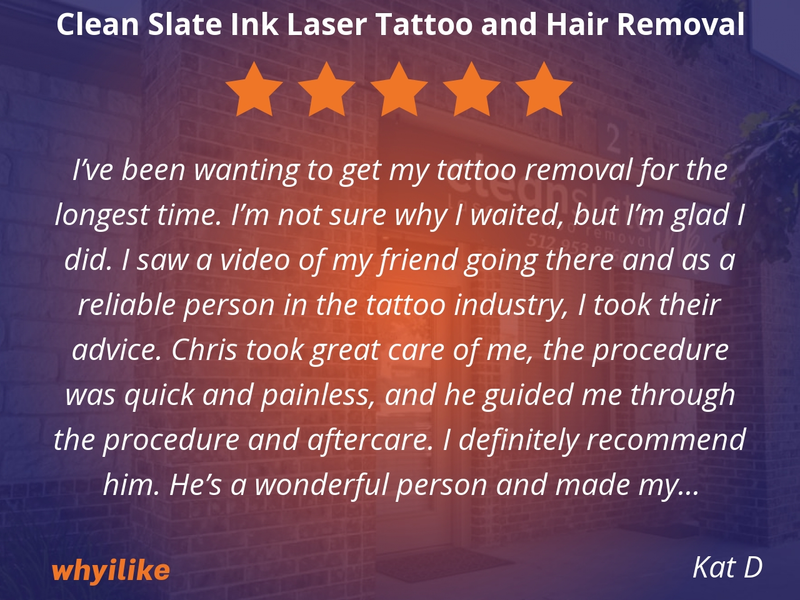 I highly recommend Chris if you are thinking about removing a tattoo. 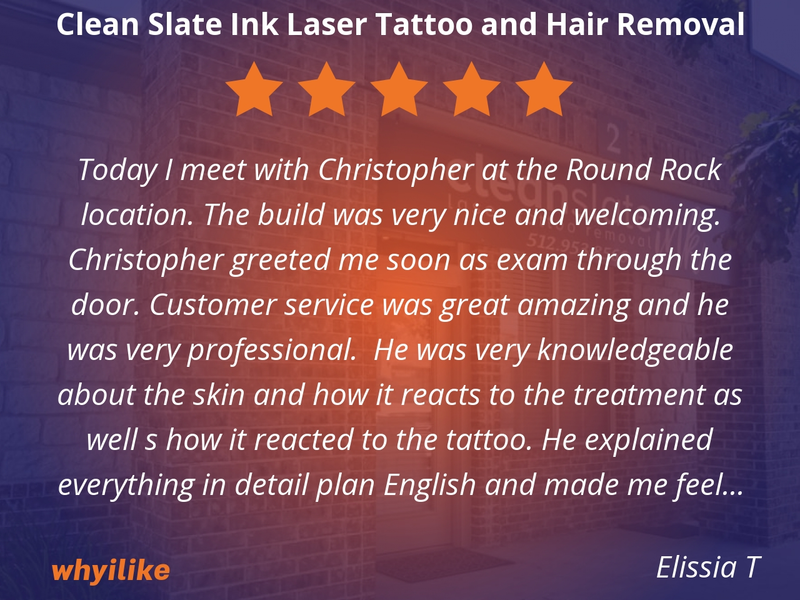 Chris was extremely professional, and educational. His place is so clean, I was shocked at how nice it was. His equipment is state of the art as well. 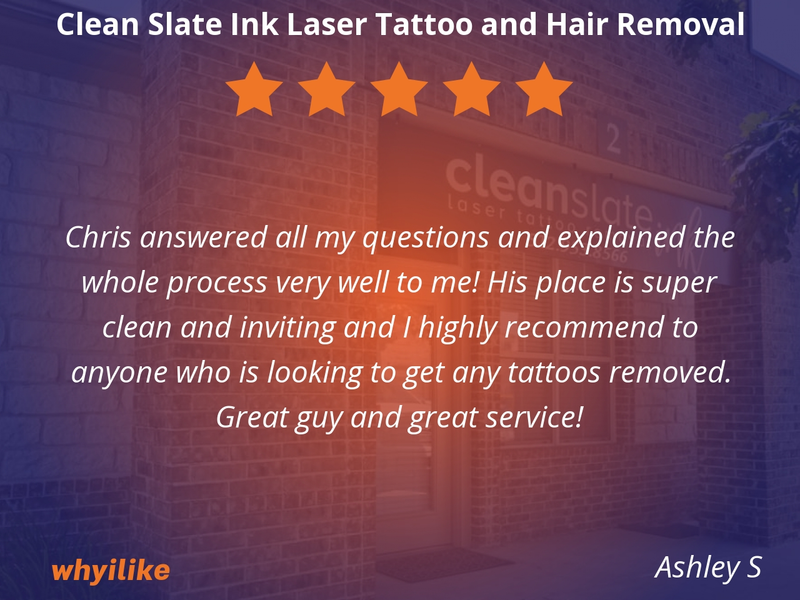 It was a very positive experience and I highly recommend him. 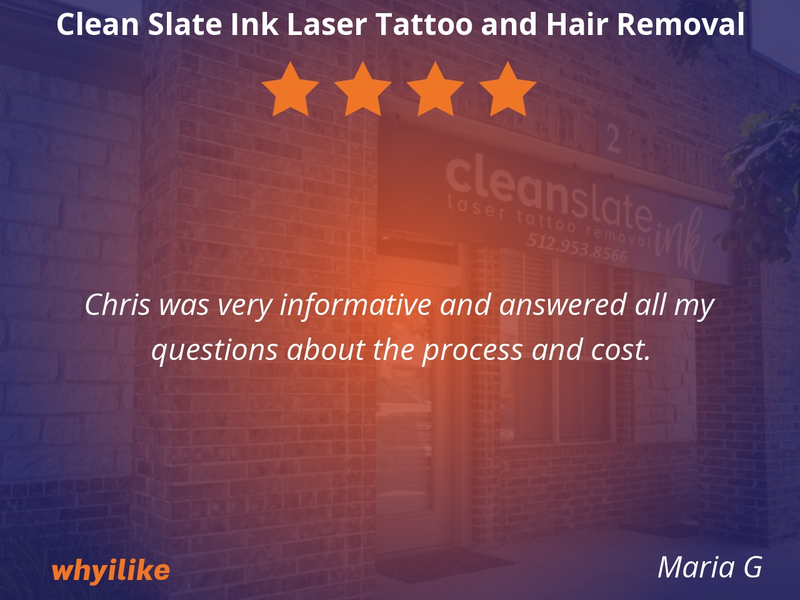 Chris was very informative and answered all my questions about the process and cost. Chris answered all my questions and explained the whole process very well to me! 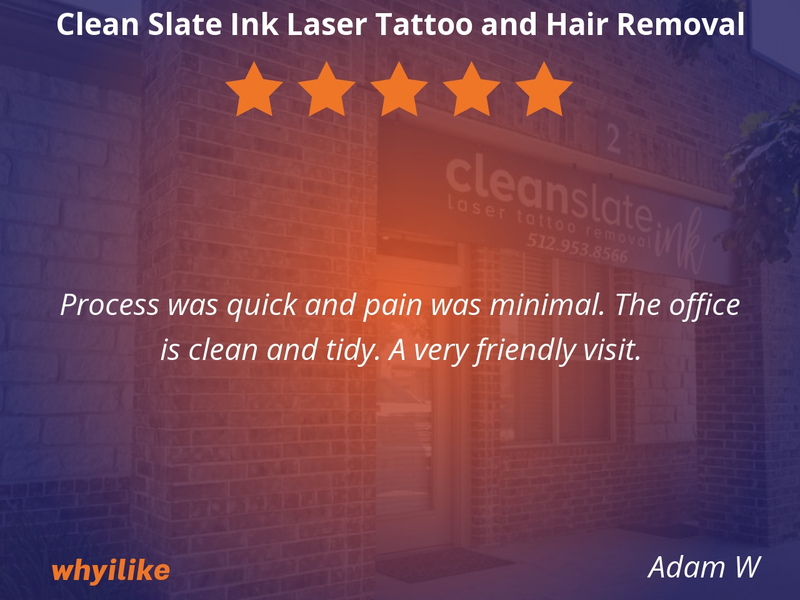 His place is super clean and inviting and I highly recommend to anyone who is looking to get any tattoos removed. Great guy and great service! Chris was awesome. 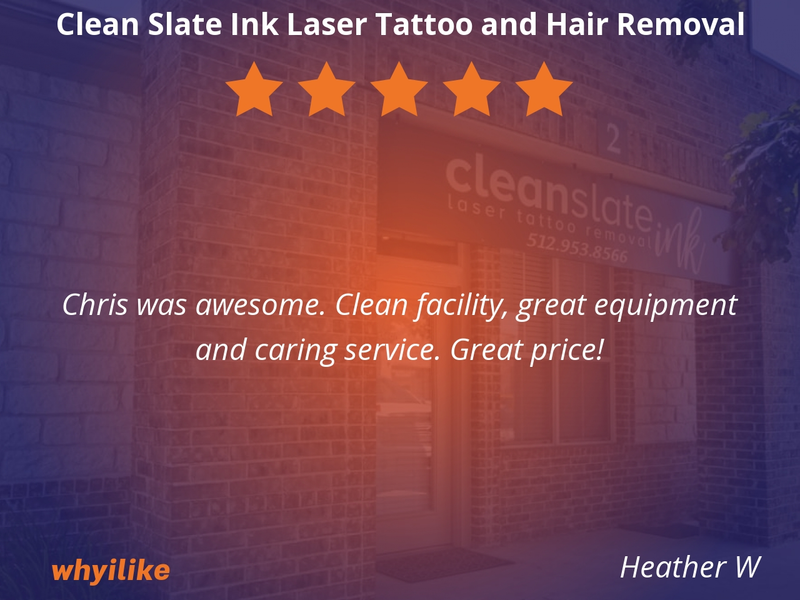 Clean facility, great equipment and caring service. Great price! Today I meet with Christopher at the Round Rock location. The build was very nice and welcoming. Christopher greeted me soon as exam through the door. 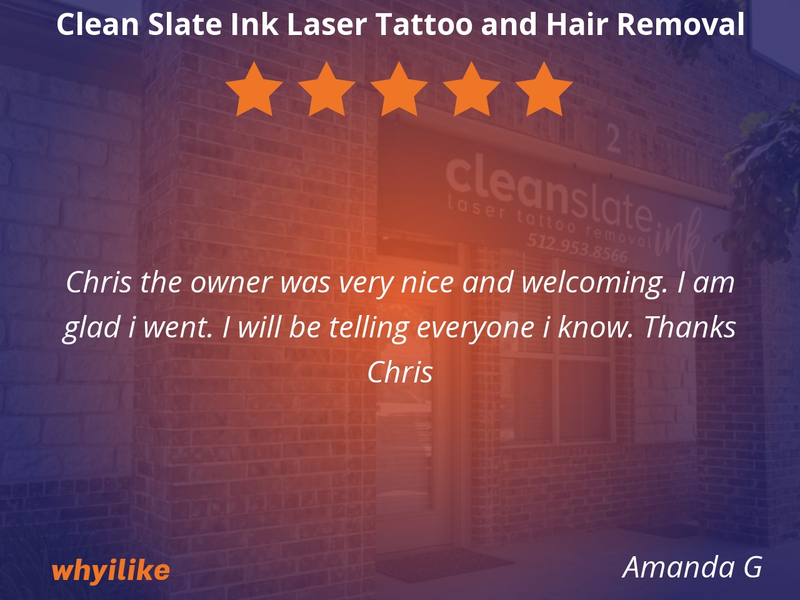 Customer service was great amazing and he was very professional. 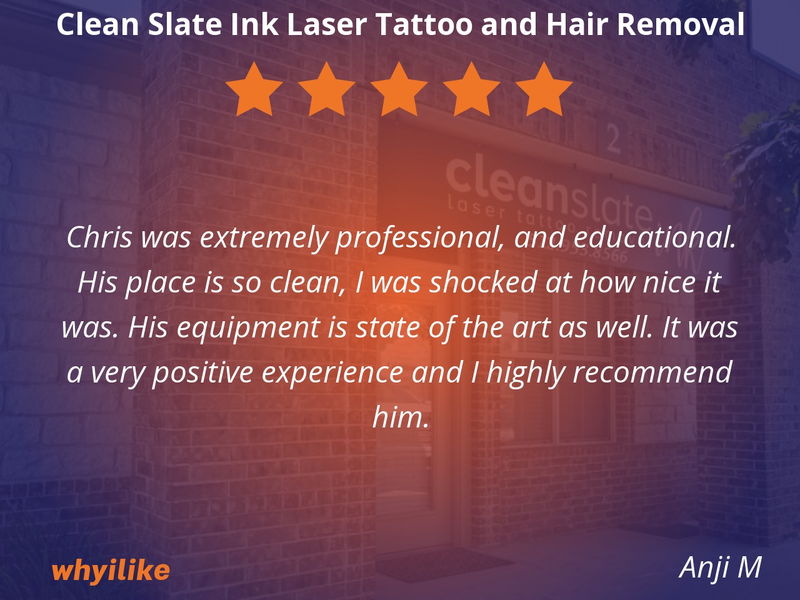 He was very knowledgeable about the skin and how it reacts to the treatment as well s how it reacted to the tattoo. He explained everything in detail plan English and made me feel extremely comfortable. The process from start to finish was so easy. Oh...yeah I found them on a Facebook add and sent a picture in a text of my tattoo I wanted removed and the response was immediately. That experience was also amazing and well. The facility is super nice and comfortable at the same time. 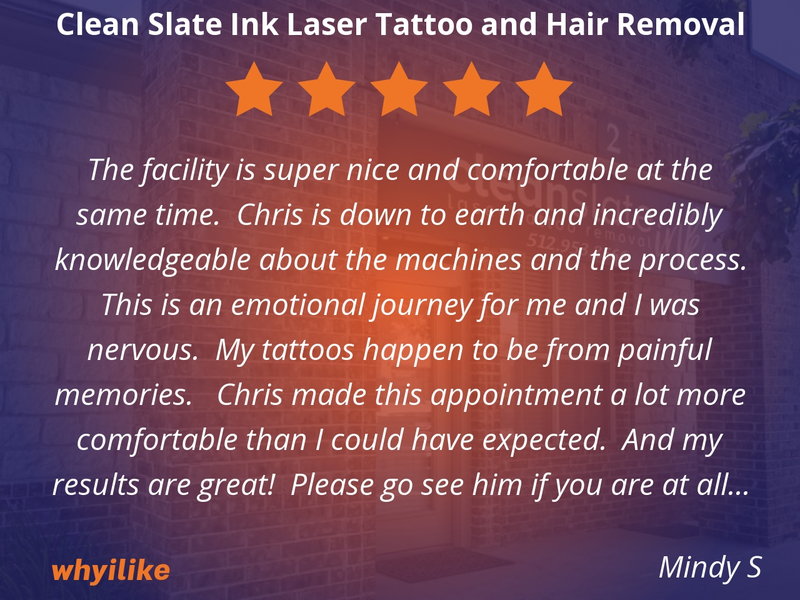 Chris is down to earth and incredibly knowledgeable about the machines and the process. This is an emotional journey for me and I was nervous. My tattoos happen to be from painful memories. Chris made this appointment a lot more comfortable than I could have expected. And my results are great! Please go see him if you are at all contemplating removal. I can’t wait to finish all my treatments! Thank you Chris!!! Chris is very professional l, his office smells good and it's very clean. He has high tech equipment and he explains everything step by step. 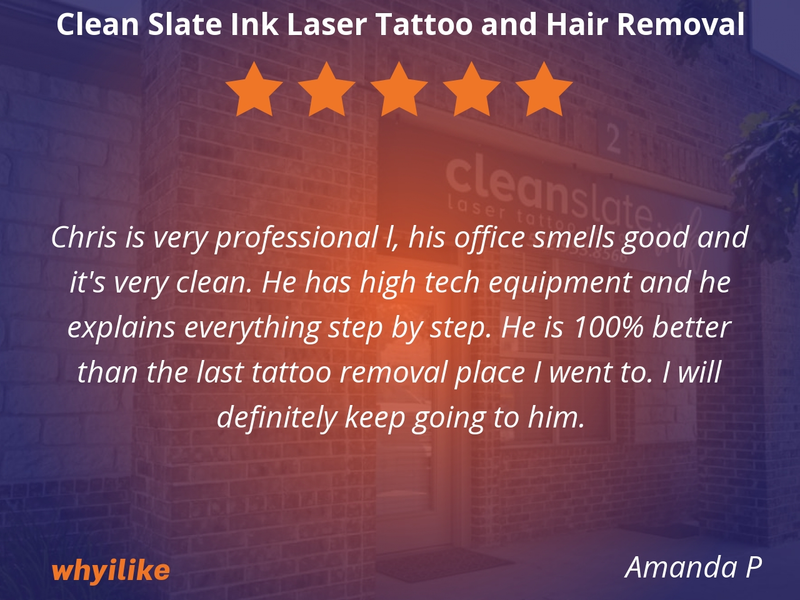 He is 100% better than the last tattoo removal place I went to. I will definitely keep going to him. 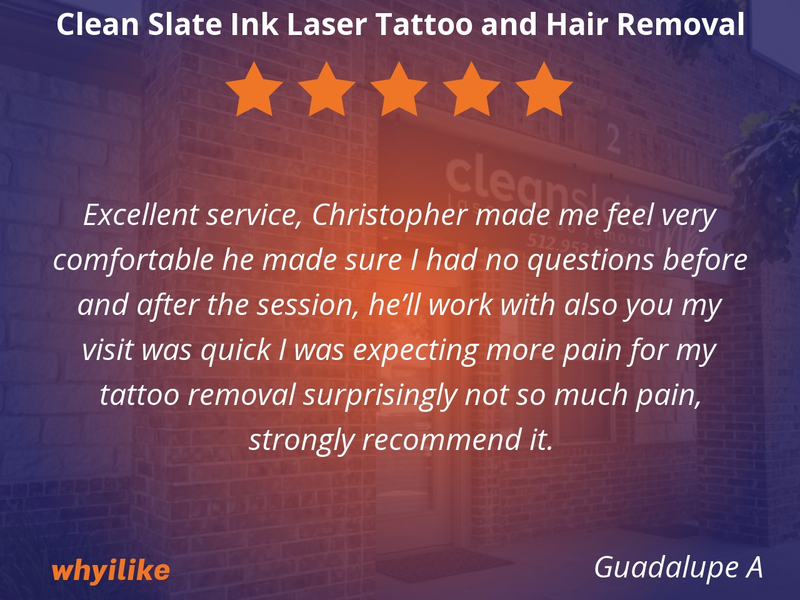 Excellent service, Christopher made me feel very comfortable he made sure I had no questions before and after the session, he’ll work with also you my visit was quick I was expecting more pain for my tattoo removal surprisingly not so much pain, strongly recommend it.